“The Kid” has one of the largest collecting bases in the hobby. You get yourself a rare Ken Griffey Jr. card and the right collectors with some deep pockets, and your going to be in for a good time. His rookies from Topps, Bowman, Donruss, and Upper Deck will always be at the core of any collection. 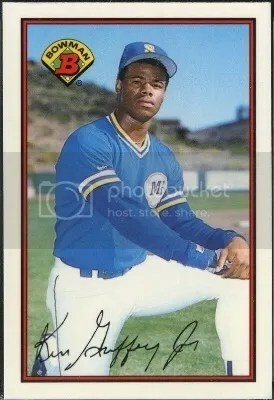 Before Ken Griffey Jr. had rookie cards made by the major manufacturers in 1989, he had a handful of minor league cards issued. Some of these minor league “rookies” have more of a demand than any traditional rookie card featuring him in a Seattle Mariners uniform. Like almost everything, it comes down to rarity and condition. 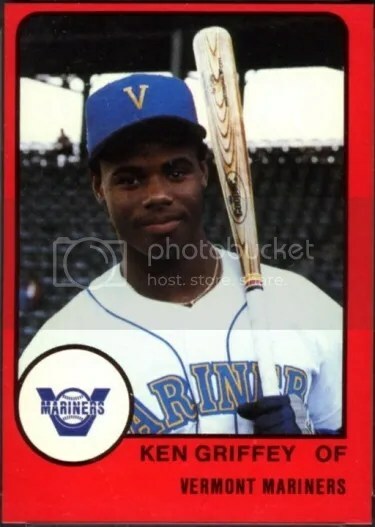 Although its not his most valuable minor league card, Ken Griffey Jr.’s 1988 ProCards Vermont Mariners #NNO is still one collectors like to own. This was his last minor league card. ProCards made a 27-card set for the Vermont Mariners in 1988. 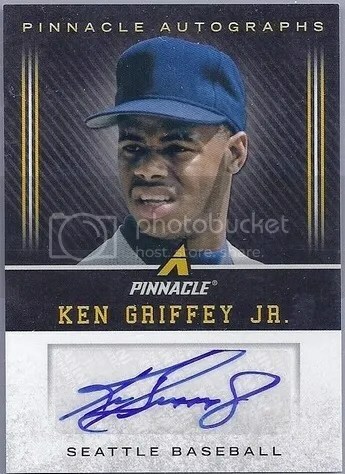 That set did not contain a Griffey. 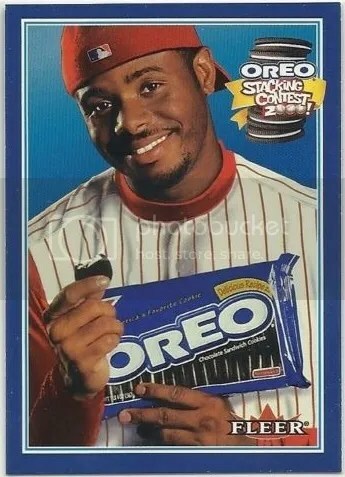 A Ken Griffey Jr. card was issued later on that year as a promotional piece. Compared to the regular set, the Griffey card is basically the same except it has a very distinct red border and doesn’t have a card number. The main set has a silver border. 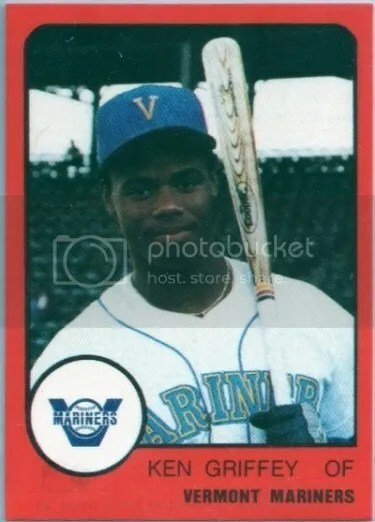 Ken Griffey Jr.’s 1988 ProCards Vermont Mariners #NNO is one of his most affordable minor league cards. But you still need to be careful when buying one. Whether they were reissued a few years later or just straight up counterfeit, many non-authentic versions of this card exist. To the untrained eye, its very easy to mistake a non-authentic card for the real thing. Pictured above is an authentic card. Below is a counterfeit. Real examples have terrible centering. Fake ones almost always have good centering. Take a look at the text on the real card. The words “KEN GRIFFEY OF” are printed in small bold font. Those same words on the fake card are printed using slightly larger font that isn’t bold. Thicker font was also used on the fake card for the words “VERMONT MARINERS”. The space between the bottom of the real card and the words “VERMONT MARINERS” is much larger too versus the fake one. You would think that buying one graded would help. But that isn’t always the case. A lot of counterfeit versions have made it passed graders like PSA. You should be alright if you follow these tips. Pinnacle is one of those manufacturers that attempted at merging collectible pins with trading cards during the mid-90’s. Inserted into packs of 1995 Pinnacle Baseball Series 2 collectors could find redemption cards that could redeemed for a die-cast pin. There were 18 different redemptions that could be pulled. 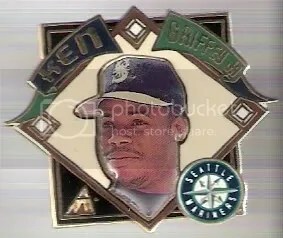 The Ken Griffey, Jr pin like the one pictured above can be found for under $5.00. 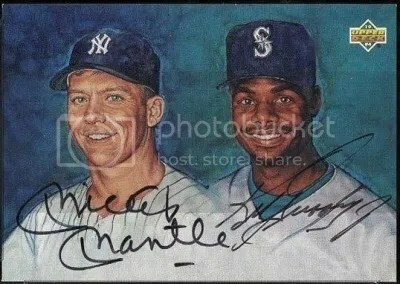 Others like Jeff Bagwell and Roberto Alomar are a little rarer and can sell for $20.00 to $50.00.